The start of the most important battle of Ralph Cheney's life began with nagging back pain during Labor Day weekend of 2004. Thinking perhaps he had pulled a muscle, Ralph opted out of a morning speedboat ride on the lake with his wife, Mariann in their hometown of Monticello, NY. By late afternoon, however, the pain began radiating from under his ribs and was almost unbearable. Ralph was admitted to his local hospital where a sonogram revealed gallstones, and he was diagnosed with painful, debilitating pancreatitis. Treatment included a highly restricted diet and surgery to remove his gallbladder. Less than three months later, Ralph experienced a second bout of pancreatitis. Again, treatment included dietary restrictions, but this time an abdominal CT scan revealed a shadow on the tail of his pancreas. His doctor suggested waiting six months and repeating the CT scan after the pancreatitis cleared up. Ralph's wife, Mariann, thought otherwise. With Ralph too weak to manage his own healthcare adequately, Mariann became his advocate. Using the Internet to research her husband's symptoms: 30-pound weight loss, debilitating abdominal pain, and suspicious CT imaging, Mariann became concerned about the possibility of pancreatic cancer. Familiar with the disease's reputation as a "silent killer," Mariann knew pancreatic cancer was difficult to diagnose. Though she knew Ralph's doctors had the best intentions, she decided that waiting six months before taking the next steps in Ralph's treatment plan was a risk they were not willing to take. Additional research brought Ralph and Mariann to the Pancreas Center at Columbia University Medical Center in New York City, where they met with Dr. Peter Stevens, Director of Interventional Radiology. During the initial consultation, Dr. Stevens reviewed Ralph's CT scans and scheduled an endoscopic ultrasound (EUS) for the following week. Although the biopsy results were inconclusive and a tumor was not clearly defined on Ralph's imaging, Dr. Stevens told the Cheneys that he suspected a malignancy and recommended surgical intervention. Dr. Stevens explained that he would present Ralph at the weekly Pancreas Conference, where a team of gastroenterologists, surgeons, oncologists, radiologists, and genetic experts would work together to develop a treatment plan. Mariann feared the worst, but was comforted when Dr. Stevens reassured her that this multidisciplinary approach to patient care delivered by the Pancreas Center's high caliber team of physicians ensured Ralph would receive the best possible care. Dr. Stevens' initial impressions were supported by the Pancreas Center team during the conference, and Ralph was referred to Dr. John Allendorf for a surgical consultation. During the appointment, Dr. Allendorf recommended surgery to remove the body and tail of Ralph's pancreas, based largely on Dr. Stevens' ability to visualize the tumor on EUS. He told the Cheneys that, based on his experience of Dr Steven's instincts regarding other similar tumors, if Dr. Stevens suspected a tumor, that was reason enough to proceed with surgery. In January of 2005, Ralph underwent a distal pancreatectomy and splenectomy at NewYork-Presbyterian Hospital/Columbia University Medical Center. Though he was relieved that the debilitating pain was gone, he was dismayed to learn that the pathology reports came back positive for ductal adenocarcinoma invading the splenic vein. The mass removed was indeed pancreatic cancer. Back home in Monticello after recovering from surgery, Ralph visited a local oncologist, and was scheduled for six months of chemotherapy and radiation. Ralph enlisted the help of his brother-in-law, Jim, to provide moral support throughout his treatment. Jim had lost his wife to lung cancer eight years earlier and was planning to move to Monticello temporarily to be with Ralph. But for Ralph, the loss of a trusted friend and loved one was to compound the trial of his illness and the challenges of chemotherapy: Jim passed away unexpectedly before Ralph was to begin his first treatment. Although Ralph fought to remain cautiously optimistic as he underwent his treatments, Jim's death tested his faith and left him emotionally drained. Despite the seemingly overwhelming obstacles Ralph faced over the course of his illness, he was able to renew his sense of hope and purpose by fighting his cancer in memory of those who no longer had the opportunity to do so, especially Jim and his wife, Jan. Almost five years later, Ralph is a survivor with no evidence of disease. Today, Ralph describes himself as filled with gratitude for this extraordinary fortune, and says he feels compelled to give back to others fighting pancreatic cancer in the best way he knows how—by sharing his story of hope and inspiration with others. Mariann and Ralph are both involved with the Pancreatic Cancer Action Network (PanCAN), where Ralph volunteers for the Survivor and Caregiver Network and provides support to patients, caregivers, and loved ones of those diagnosed with pancreatic cancer. This November, the Pancreas Center and PanCAN will be teaming up for Purple Stride, a walk in New York City's Riverside Park to raise funding and awareness for pancreatic cancer. Last November, Ralph and Mariann attended the Pancreas Center's Pancreatic Cancer Awareness Day events to support the patients and to thank Ralph's physicians at the center. A highlight, Ralph said, was being asked by Pancreas Center Medical Director, Dr. John Chabot, to speak at the event. "There is not a day that goes by that we don't think of Doctors John and Pete and what Columbia means to us," says Mariann, "we are grateful for the gifts we are given in whatever form they come, for the gifted hands that heal, and for the ability to connect to each other in our times of need." 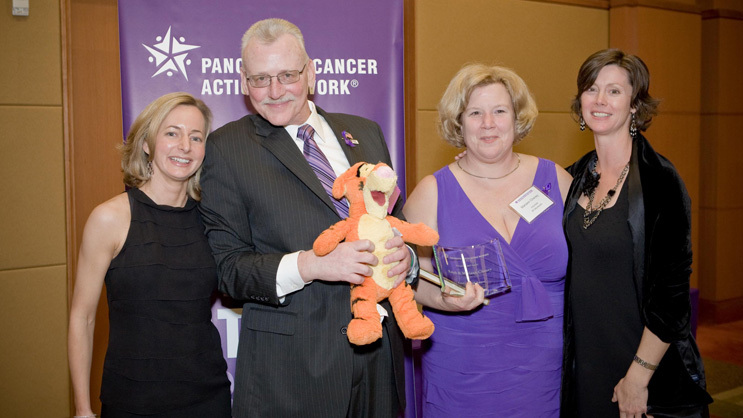 Ralph Cheney and his wife, Mariann, were recognized with the Pancreatic Cancer Action Network Randy Pausch Award on March 27, 2010 at the organization's annual Community Outreach Leadership Training in Dallas, TX. Created in honor of Dr. Pausch, a Carnegie Mellon University professor who died of pancreatic cancer in 2008, the award is presented to an individual who embodies Dr. Pausch's optimism, courage, and enthusiasm for life in the face of this disease. In addition, the award recognizes a volunteer who champions the Pancreatic Cancer Action Network mission of advancing research, supporting patients and creating hope for those affected by pancreatic cancer. Since Ralph's January 2005 surgery at the Columbia Pancreas Center to remove pancreatic cancer and a subsequent recovery, he and his wife, Mariann, have become enthusiastically involved with Pancreatic Cancer Action Network. Ralph volunteers for the organization's Patient and Liaison Services Survivor and Caregiver Network by providing support to patients, caregivers, and loved ones of those diagnosed with pancreatic cancer. Visit the Pancreatic Cancer Action Network website.